According to the theory of reflexology, the body is divided into ten longitudinal zones, with five on each side of the vertical line. Parts of the body and organs lie in these zones. It is believed by all reflexologists that the sole of the foot mirrors the body, with the left foot reflecting the left side of the body and the right foot the right side. Hence, it is deduced that pressing the sole in the apposite place will cause an advantageous effect to be felt in the respective part of the body. There are many acupuncture points on the soles of your feet which are in charge of the functions of various body organs. If these points are not stimulated regularly, they tend to age rapidly, which in turn, so will the body organs they correspond to. As mentioned, a perceptive area in the foot indicates a problem in the consequent organ in the body. Pressing on the appropriate trouble-spot can be an effective way of relieving pain and helping to restore the body's natural balance. It can also reduce stress, improve circulation, accelerate metabolism and revitalize energy levels. In order to stimulate these reflex points in your feet, reflexology shoes and sandals have been introduced. Reflexology Sandals were created so that people can be capable of giving themselves this type of therapy effortlessly and inexpensively. This is achieved with the massage nodules on these sandals. They are raised to follow the contour of the feet. 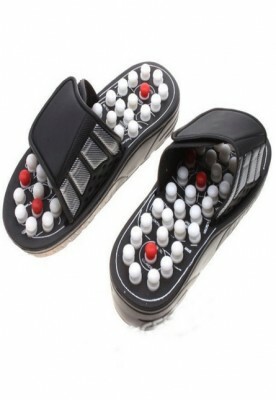 The pegs basically stimulate the reflex area when one wears the sandals and are removable, so that you may customize the sandals to target specific pressure points. A number of people begin by wearing these shoes for only five minutes in the beginning and then progressively increase the periods, for example while doing the dishes or while talking on the phone. Make sure that you do not wear these sandals all day long as they are only meant to be worn for short periods of time to stimulate your reflexology points. 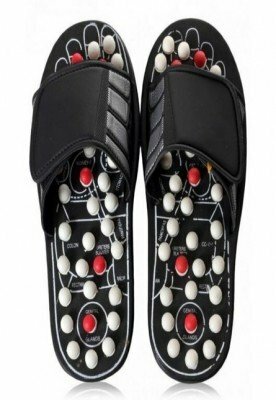 This shoe (sandals) will follow your change of weight and personal footfall to find your acupressure points. So it could be your personal massagist efficaciously. The forty-one spring raised particles are separated into different stress.